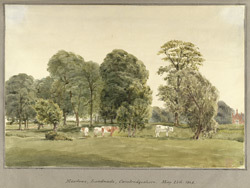 View of cows and trees in a meadow in Landwade. Landwade is a manor and parish on the Suffolk/ Cambridgeshire border, about 4 miles north of Newmarket. This is probably parkland near Landwade Hall, which was used for grazing cows. In the right corner of the picture is a red brick building, possibly Landwade Hall, home of the manorial family, the Cottons. The manor house was a red brick, early 16th century building. John Chessel Buckler was employed to redesign it, and during his stay here in April and May 1848, he took a number of views of the area.